I am still in love with bread and the making of it. Not sure if I’ll really ever get properly into cakes or pastry, too much of a savoury girl, but the baking of bread results in my favourite food. However you need time to do it, and although there’s nothing more satisfying than a morning spent kneading, fermenting, knocking back, shaping, proving and baking, it doesn’t happen that often! A quicker option is focaccia, so that occurs with a little more frequency, but it still needs at least an hour and a half total rising time. But my most recent discovery, soda bread, could not be any easier or speedier, and now I’ve hit on a good recipe (my first, a plain white one, was more like a scone than a loaf and begged for clotted cream and jam, rather than butter and eggs) this is going to appear in my kitchen with much regularity. The only fresh ingredient required is buttermilk, but it seems to be pretty easy to find and has a fairly good shelf life so it’s not a problem to ensure I’ve usually got some of this kicking about. Don’t get me wrong, this isn’t a light, airy loaf. 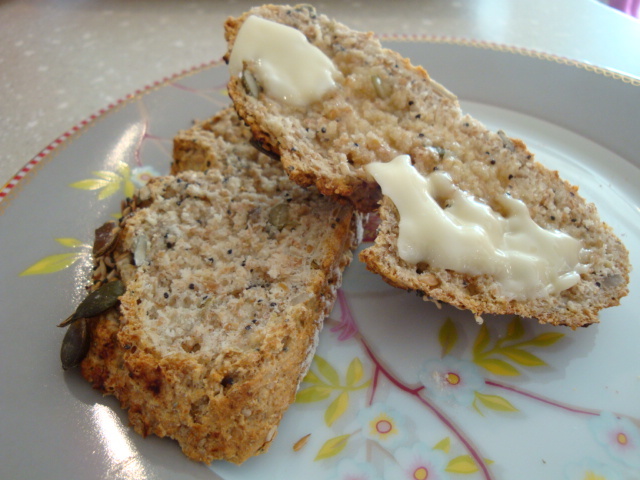 The texture is pretty dense and full – but it is warm, fresh, tasty and toasts beautifully. And it can be in the oven as quickly as the oven can heat up! 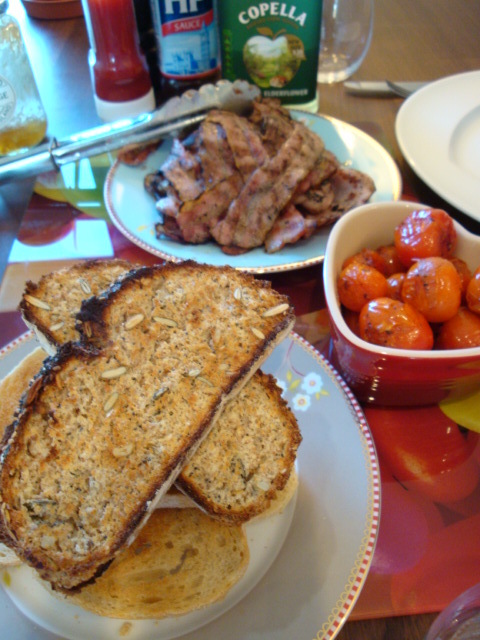 Toasted with bacon and roast tomatoes. Breakfast's ready! Cup of tea? Check. The Archers? Check. Ingredients? Check. A lot of recipes call for 500 grams of flour but I find that makes too big a loaf and prefer this volume which results in a cute little soda bread that will be polished off in no time, and if there’s not enough? Well you can always very quickly knock up another! 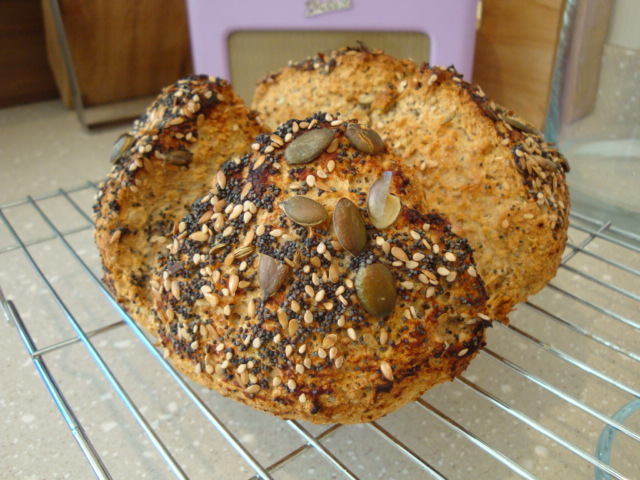 A heaped tablespoon each of pumpkin, sunflower, sesame, golden linseed and poppy seeds (or any combination you fancy) plus about half a teaspoon of fennel seeds if you’re planning to eat the bread with savoury toppings, otherwise leave them out cause they don’t really go very well with strawberry jam! Put the oven on at 200 o to warm up. Sift the flours with the bicarbonate of soda into a bowl. Mix all the seeds together and put about 2 tablespoons to one side. 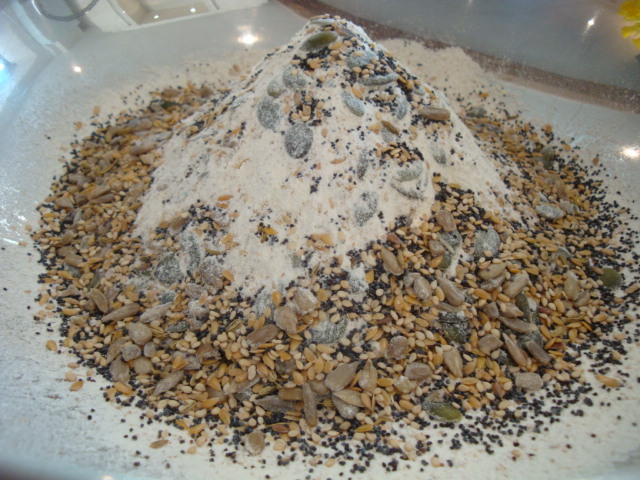 Stir the salt and remaining seeds into the flour then make a well in the centre. When the oven is hot and ready, and not before, pour the buttermilk into the well and stir quickly to combine, either with a spoon or with one hand. 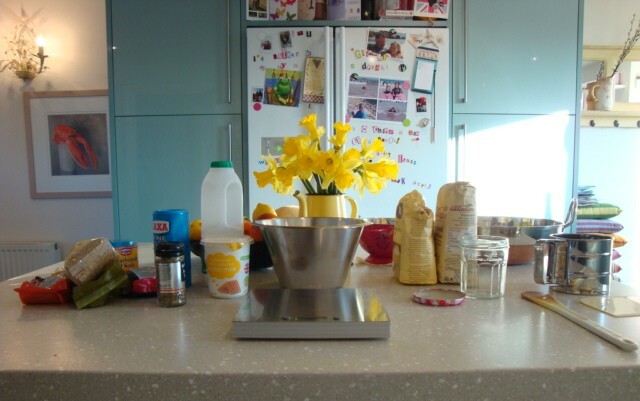 As soon as the mixture is combined turn it out onto a surface and bring it together into a round shape. The dough should be just a bit sticky – if neccessary add a little milk to bring it together or a little more flour if it’s too wet. Now here’s the good bit: there is no need to knead! Quickly place the round dough onto a lightly floured baking tray then, using a serrated knife, cut a deep cross in the loaf about two-thirds of the way down. Now brush the top with the remains of the buttermilk from the tub, or with a little normal milk and sprinkle over the reserved seeds. Immediately put it in the oven and bake for 35-40 minutes until the bread sounds hollow when you tap it underneath. Leave to cool on a wire rack for at least 10 minutes if you want to eat it warm, or until completely cool. To store it either keep it in a plastic bag or wrap in clingfilm and it will last quite well, and is great toasted the next day. That is a decent amount of seeds to put in one bread! Great recipe, thanks for sharing. I’m a bit behind on my list of dishes from your blog I need to cook! This looks delicious – YUM! How can I begin my diet when you post recipes like this? Just off to increase my seed collection, then also to make Lizzie’s birthday cake – another diet day blown! !